This Turkish Delight recipe is a traditional version of the classic Middle Eastern sweet. 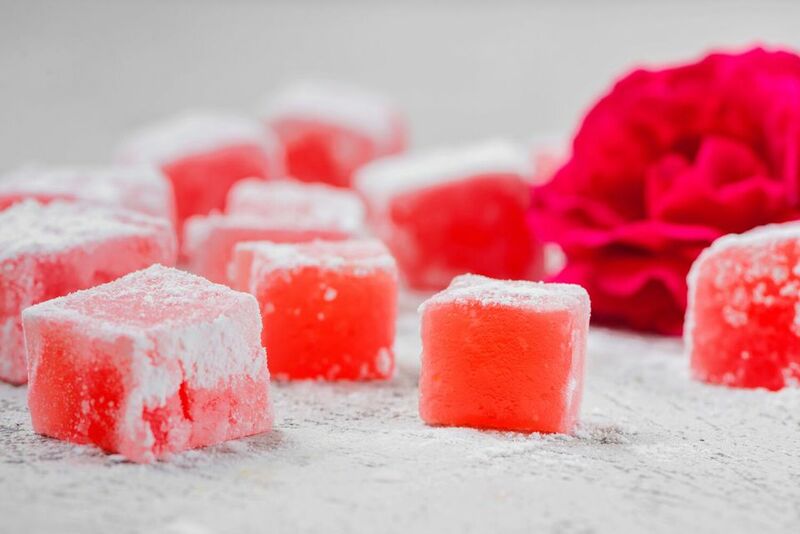 If your only exposure to Turkish Delight has been the stale store-bought variety (or even just a reference in the Narnia books) you are in for a treat! Freshly made Turkish Delight is delicately chewy, perfectly sweetened, and scented with the exotic flavor of rosewater. A note about the ingredients: rosewater can be found at Middle Eastern markets and at some well-stocked supermarkets, as well as many online retailers. There is really no substitute for this distinctive flavor, but if you cannot find it you can use another flavored extract like lemon, mint, or any number of floral flavors. Prepare a 9-by-9-inch pan by lining it with aluminum foil and spraying the foil with nonstick cooking spray. Set aside for now. Place the sugar, lemon juice, and 1 1/2 cups of the water in a medium saucepan over medium heat. Stir until the sugar dissolves, and bring the mixture to a boil. Allow the sugar mixture to continue boiling, without stirring, until it reaches 240 F on the candy thermometer. When the sugar syrup is around 225 F, begin to get the rest of the candy ingredients prepared. Place the remaining 3 cups of water in another, slightly larger, saucepan. Add the cornstarch and cream of tartar and whisk until the starch dissolves and there are no lumps. Once the sugar syrup is at 240 F, remove it from the heat. Slowly, carefully, pour it into the cornstarch mixture, whisking until it is fully incorporated. Reduce the heat to low and simmer, whisking it every 8 to 10 minutes, for about an hour, until the candy has turned a light golden-yellow color and is very thick and gluey. After an hour, remove from the heat and stir in the food coloring and the rosewater. The next day, remove the candy from the pan using the foil as handles. Dust your work station with the powdered sugar, and flip the candy onto the powdered sugar. Remove the foil from the back and dust the top with the sugar. Use an oiled chef’s knife to cut the Turkish Delight into small squares. Dust each side of the square with powdered sugar to prevent stickiness. Turkish Delight is best soon after it is made, as it doesn’t keep very well. But, if you want to try keeping it, store it in an airtight container with waxed paper between the layers, and dust the sides with powdered sugar again before serving.